POSIDON PCP project gathers 5 European procurers, two front-runners: Port Network Authority of the Eastern Adriatic Sea Port Of Trieste (IT) and Bilbao City Council (ES) and three observers: Spaque (BE), CEA - Vitoria Gasteiz City Council (ES), Baja do Tejo (PT), all facing a common soil decontamination challenge in their managing sites and all leveraging public demand to identify fit for-purpose and cost - effective innovative and sustainable soil decontamination solutions. The common need identified by the buyers’ group concerns a soil (and eventually groundwater) remediation new, life-cycle, cost-effective technology, preferred as in-situ (and eventually on-site), capable of decontaminating the heterogeneous anthropic soil in soil/groundwaters, composed of a mixture of various industrial wastes (like filling soils highly polluted by petroleum hydrocarbons and heavy metals) and soils consisting of clay and sand highly polluted by petroleum hydrocarbons (TPHs), PAHs and heavy metals. PCP - pre commercial public procurement is a competitive multiple-sourcing procedure for procuring applied research and technological development services. It involves different suppliers competing in parallel through different phases of development. Evaluation following each phase progressively identifies solutions offering the best value for money. Phase 3 - Original development of test series and field testing in 2 sites. POSIDON PCP expects to have 6 suppliers in Phase 1, 4 suppliers in Phase 2 and 2 suppliers in Phase 3. Phase 1 - Original solution exploration and design, based on a feasibility study is intended to demonstrate the feasibility of proposed concepts for new solutions. Phase 1 will have a total duration of 5 months, out of which 3,5 months will be fully allocated to the work to be completed by the Phase 1 Contractors. Phase 2- Prototyping is intended for the development and evaluation of prototypes from the more promising concepts in Phase 1. Participation in Phase 2 is dependent upon successful completion of Phase 1. More specifically, selected Contractors will each develop a prototype based on the results of their feasibility study. The aim is to verify to what extent the prototype’s main features meet the functional and performance requirements set in the POSIDON challenge description. Participating Contractors are expected to deliver a prototype specification during lab demonstration, as well as a plan for original development of a limited volume of first solutions and field-testing, and an updated cost/benefits evaluation including a preliminary business plan. Phase 3: Original development of a test series and field testing in 2 sites is intended for the original development of a limited volume of first products test series necessary to execute field testing activities in two countries. More specifically, it aims to verify and compare the full feature set and performance of different solutions in real-life operational conditions (residential and industrial sites). The aim is to verify to what extent the prototype’s main features meet the functional and performance requirements set in the POSODON PCP challenge. The tests will be carried out in 2 out of 3 different in Bilbao (Spain), and/or in Trieste (Italy) and/or in Laminoir de la Rochette, located in the Municipality of Liège (Walloon region, Belgium), as it will be indicated by the Lead Procurer at the beginning of Phase 3, ensuring that a performance comparison can be made between the various environmental, legal and contamination conditions. Participation in Phase 3 is dependent upon successful completion of Phase 2. Phase 3 will have a total duration of 14 months, out of which 11,5 months will be fully allocated to the work to be completed by the Phase 3 Contractors. 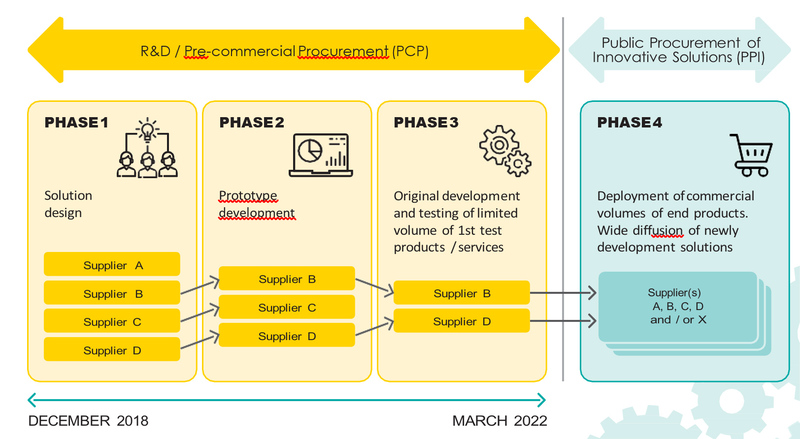 Phase 3 awarding period will start the 24 th of May 2021, until 25th of June 2021; Phase 3 field testing activities will take place from 21st of July 2021 to 13th of September 2022. During each phase, the awardees contract implementation will be monitored periodically and reviewed against the expected outcomes (milestones, deliverables and output or results) for the phase. The intensity of monitoring and communication between the POSIDON Monitoring Board and the R&D services providers will increase from Phase 1 to Phase 3. In Phase 1, contractors will be asked once to shortly report their status and the issues that they are facing in the development of their solution design (milestones, deliverables and output) on paper and in meetings conducted remotely/at the Lead Procurer premises. At the beginning of Phase 2, each contractor will be assigned a main contact person (their supervisor) from the Monitoring Board appointed by the procurers. In Phases 2 and 3, where solutions need to be developed, there will be regular monitoring meetings between the contractor and the Monitoring Board. The meetings will take place physically when milestones are achieved or/and when necessary, after formal communication. The contractors could be asked to discuss the results achieved in the preceding period and present their updated work plan; the monitoring board or the appointed supervisor could visit the contractor’s premises to periodically monitor progress; the contractors could visit the procurer's premises when planned and specifically authorized (in particular at the start of a phase 1 to get to know better the operational environment that solutions need to be designed for and during phase 2). The Monitoring Board will provide regular feedback to contractors after meetings or visits. On the Completion Date of Phase I, the Tenderer shall submit to the Lead Procurer an “End of Phase Report” regarding such Phase together with the deliverables belonging to Phase I, which shall thereupon be reviewed and assessed by the Monitoring Board in order to determine whether the Contractor has complied with the Common Challenge and the Functional requirements. The Monitoring Board shall issue its decision regarding the satisfactory or successful completion of every Phase, within 3 weeks after the Completion Date of the Phase. In case the volume of Contractors leads to a longer evaluation process the Tenderers will be informed. POSIDON project is looking for independent experts in soil decontamination to be potentially appointed to assist POSIDON PCP in phases 1,2,3 with the technical evaluation and technical monitoring. supporting technical monitoring supervisor/monitoring team in phase 1, 2, 3 in the monitoring of interim milestone(s)/deliverable(s), as well as Phase 2 lab prototype demonstration and Phase 3 field testing activities. As an expert you perform this work as an independent individual and do not represent a company or organization. POSIDON recruits experts from a database, where you can register at any time during the project life (April 2019 – November 2022. Registration is open to experts of any nationality including those outside of the EU and Associated Countries. European H2020 rules for “Working as an expert” will be followed. Place of work: All or part of the evaluation and monitoring may be carried out at your home or place of work (remote evaluation), or at POSIDON awardees laboratories or POSIDON field testing sites [Trieste (I), Bilbao (E), Liege (B)] , depending on the type of work to be done. Conflicts of interest: POSIDON PCP will not appoint you as an expert for technical support if you have a vested interest that could influence the way you examine and evaluate it. For more detail please see section ‘contracting & payment’ and the model contract for experts. Remuneration (European H2020 rules for expert remuneration will be followed): as an expert, you will receive €450 for each full day worked. However for remote evaluation the POSIDON Consortium adopt the Commission’s new simplified methodology to calculate the working days, please see details in the contracting & payment Your travel and subsistence costs will be refunded. The POSIDON PCP partnership, depending on which kind of particular expertise are required to the technical awarding commission in the three different PCP-phases and/or to the technical monitoring supervisor/monitoring team for supporting in the evaluation and/or monitoring of the of interim milestone(s)/deliverable(s) will select, time by time, from the POSIDON experts database, the most suitable expert profile according to his/her skills and expertise. Experts can be selected for more than one POSIDON PCP phase and assignment. The selected expert will be contacted by email in due course to let him/her know he/she has been selected for a specific POSIDON phase. Experts who support POSIDON partnership in monitoring the reports and/or deliverables developed/presented by the awardees in POSIDON PCP Phase 1,2,3. The first tasks may involve attending meetings of groups of experts and remote working, as specified in the contract. For each task and for each POSIDON phase, registered experts will be asked by email to confirm their availability to be a POSIDON expert. The selected expert will be asked to accept or decline the assignment within 5 working days. Monitoring may cover scientific, technological and other aspects of the deliverables/reports developed by the Posidon PCP awardees. The POSIDON partnership may require the expert to carry out on-site technical visits to verify whether critical milestones are being met, or to assist in carrying out analysis during implementation. If you are selected as an expert, you will be offered a contract through direct contact with POSIDON partnership. This contract (including its annexes) defines all the rights, obligations, terms and conditions applicable to you. It is not an employment contract or agreement. the planned calendar for your work. All your correspondence with POSIDON partnership will be electronic by e-mail: gare@porto.trieste.it ; info@posidonproject.eu . You should communicate by e-mail to trasmit your contract, e.g. making requests for payment and providing related supporting documents. You must sign the contract electronically. The contract enters into force only once it has been signed by both parties. The contract must be signed by both yourself and POSIDON partners by the day on which you start working as an expert. Please do not forget to obtain permission from your employer to carry out your expert activities if your employer requires this for outside activities – this is your responsibility. You may start work as soon as the contract has entered into force. You need to adhere to the code of conduct in Annex 1 of the model contract model contract , which includes rules on the performance of the contract and obligations of impartiality and confidentiality. It is important that you read Annex 1 carefully before signing the contract. See also "conflicts of interest and confidentiality" below. When contracting independent experts, POSIDON partnership ensures - to the best of its knowledge - that you, as an expert, do not have any conflicts of interest on the activity that you are being asked to undertake and, in particular, any enterprise deliverable or proposal you are called upon to support in assessing . You should be independent, impartial and objective, and behave professionally at all times. you will inform POSIDON partnership if you should discover that any such conflict arises in the course of your duties. If, at the time that you sign the contract, you are already aware that you may be in a position of conflict of interest, you are required to declare this. Consequences of a Conflict of Interest? To avoid situations of conflicts of interest, POSIDON partnership may withdraw experts from supporting in technical evaluation and technical monitoring duties if it deems that this is necessary. You will be informed if this happens to you and advised as to what to do if you need to take action. If you knowingly conceal a conflict of interest and this is discovered during your activities as an expert, you will be dismissed with immediate effect, your contract will be terminated, and the measures laid down in the contract will be taken. We strongly advise you make sure that you have properly understood the provisions laid down in the Code of Conduct, especially which situations are automatically considered to be a conflict of interest. If your role involves handling classified information, you will need security clearance before entering into a contract. Once your work is completed, you will receive an e-mail inviting you to submit your request for payment by e-mail. When you claim your travel expenses, you should upload scanned copies of all the original supporting documents as requested. You must keep records and other supporting documents for at least two years after the payment is made to show that you have complied in full with the terms of your contract. Deadline: You should submit your request for payment within 30 days of receiving the e-mail invitation. Bank account: You should request payment on one of the bank accounts which you have communicated by email. for remote work carried out by evaluators, any work that you are specifically asked to carry out remotely will be paid in accordance with Article 4.1 of your contract. The contract sets out the maximum total number of days of work that you can be paid for. This is an upper ceiling. The number of working days that you will be paid for is based on the actual task assigned and worked; this may be less than the maximum number of working days. Please note that you will not receive payment for tasks that are not covered by the contract and which are not specifically assigned to you in writing by POSIDON partnership. The reimbursement of travel expenses and payments of accommodation allowance and daily allowance (see below) are made on request and in accordance with the Commission Rules on the reimbursement of expenses of experts (see the annex of Commission Decision C(2007)5858). If your contract includes activities involving travel, expenses are refunded for this travel - normally between the address indicated in the contract (the address registered in your expert profile) and the meeting venue indicated in Article 3.1 of the contract. If you exceptionally need to travel to or from a different location than the address in the contract, you need the POSIDON partnership's explicit agreement prior to purchasing your tickets. You should book your travel as soon as possible to keep costs reasonable, but you should NOT book your travel before your contract has been signed by both Parties. allowances may be increased for disabled experts, see below. Expenses that you incur as a result of special instructions received in writing from POSIDON partnership, different from the contract terms, may be reimbursed in justified cases on presentation of supporting documents. Please note that no other expenses will be reimbursed. You are obliged to ensure compliance with your national legislation on taxes and social security law – this is your responsibility. Any payment you receive is not exempted from national taxes. Disabled experts - If an expert's disability requires that a person accompany him/her when travelling, then the travel expenses of that person will also be refunded upon prior request. The POSIDON Consortium will also pay accommodation allowances and daily allowances to the accompanying person. You must send all original documentation related to expenses in order to have the reimbursement. Do you have a conflict of interest and consequently cannot ask for ‘working as an expert’ in POSODON PCP, if you have collaborated for presenting an offer to participate in POSIDON PCP.